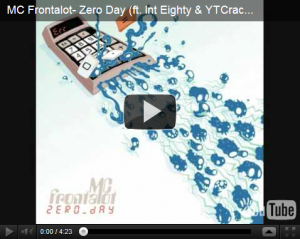 MC Frontalot Releases "Zero Day"
"Zero Day" the album that is. Wired has a review. You can read the full lyrics on Frontalot's site. Here is a snippet: Press play, prepare as history is made: "largest hack in one day," all the headlines will say. All out of time, hear the chime from the buzzer. Found this bug on my own, no need for a fuzzer. "It's already too late," spreading as we planned. No need for the NO OPs, I know just where to land. Clearing out the registers, with pointers to my functions, loaded to your memory and writing new instructions.